My mother, Jane Wiske, a gifted artist, was born and died in Bronxville, Westchester County, New York. Her parents, Prescott Barker Wiske and Kathryn Utz (Granny), moved from New York City to Mount Vernon (next to Bronxville) in the 1890s. On her 18th birthday, my mother Jane had dinner with her future mother-in-law, Connie McCoy. Jane would eventually marry my father, Rawley Deering McCoy, about twelve year’s later. My mother and I both attended Bronxville High School. Several of my teachers taught my mother at Bronxville High School in the 1930’s. My father, Rawley Deering McCoy, an electronic engineer, and his brother John McCoy were born in Nutley New Jersey and raised in Greenwich Village New York. His sister, Carol McCoy, was born in Havana Cuba where my grandfather, Paul McCoy, was on business. The McCoy family moved to Bronxville New York when Rawley was fairly young. 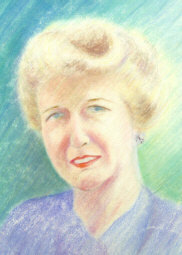 Beautiful pastel drawing of Kathryn Wiske by her daughter Jane Wiske McCoyMy grandmother, Kathryn Mildred Utz, was born in Mount Vernon, New York, and much to her dismay, died in Texas. She was a charming and vivacious woman who learned to drive long before there were any driving requirements. She learned to stop by crashing into some bushes in the yard since her brother forgot to tell her where the brakes were! 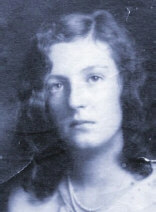 Kathryn Utz, was the daughter of John Utz, a “great” builder of beautiful homes in Bronxville and Mount Vernon New York. Her mother was Amalia Neander, known as Mollie. Kathryn married the dashing Prescott Barker Wiske, who was an electronic engineer who graduated from Stevens Institute of Technology in Hoboken, NJ (as did my father.) He died just before DDay in WW II. Kathryn and her husband Prescott Wiske had two children—my mother Jane and my Uncle John. 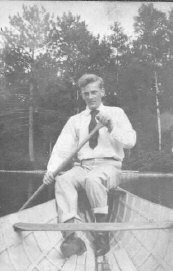 Prescott Barker Wiske at Bryant Pond, Maine 1905My great grandfather, John Utz (my mother’s maternal grandfather) was born in New York City in 1857 to a German immigrant, Johannes Utz, who came to America as an orphan around 1850 when he was about 20 years old. He married Antoinette Huppach in 1853 in St. John’s Evangelical Lutheran Church in NYC. Johannes (John) Utz died in 1882 in New York City. John Utz was a highly successful contractor and builder and contributed several beautiful homes, which still stand today in Bronxville NY. John Utz married Amalie Neander, whose father, Theodore Neander, came to New York City from Bremerhaven (Geestendorf) Germany at age 15 during the turbulent 1840s. Amalie Neander Utz (family photograph)Theodore Neander was a struggling grocer in New York City where he married in 1860 Jane Victoria Ferrier, whose family came from Barnard Castle in Durham England during the 1830s. Jane, the youngest of a very large family, was born in New York City to John and Ann Ferrier. The Ferriers were in the water bottling or distillery business and apparently knew the Neanders through their grocery business. In the 1860 US Census you can see that the newly married Theodore and Jane Neander lived next to the widow Ann Ferrier in New York City. 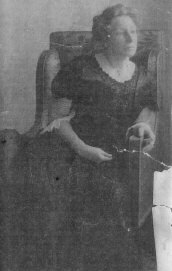 Amalie Neander (aka) Mollie was born in the 1860s in New York City, and she died in the 1920s in Bronxville, New York.